Home security is important more than ever. Homeowners would want to keep an eye on their homes even while away. Security cameras provide the possible solution. They can be a means of monitoring sensitive areas in the home as well as a visible intruder deterrent. This FLIR FX Outdoor Wireless HD Security Camera makes it even better by providing convenience and ease. The FLIR FX Outdoor Wireless HD Security Camera is a versatile home security device. It can help provide some peace of mind by giving you the means to check up on your home whenever you need to when you are someplace else. The FLIR FX provides quality HD videos using a high performance 4MP image sensor. It also comes with a 160-degree super wide field of view. The device also comes integrated with temperature, sound and motion sensors. The camera can also provide alerts and notifications to the homeowner when the sensors are triggered in addition to recording the moment. The rugged and weatherproof housing makes it into a capable outdoor security camera protecting it from the elements. The housing also adds four powerful IR LED’s to provide security-grade night vision capabilities. It can scan for distances of up to 65 feet or 20 meters in the dark. The FLIR FX Outdoor Wireless HD Security Camera comes with a microSD card slot. This slot can support up to 64GB of memory for storing the security footage. The camera’s RapidRecap system makes review more convenient by compiling hours’ worth of footage and then presents it into a short video summary. Its WiFi capabilities allow the camera to be set up from up to 500 feet or 152 meters away from the network. Users can also access its live video stream while they are somewhere else via a smartphone or a tablet by using an app. The FLIR FX Outdoor Wireless HD Security Camera also comes with a two-way audio intercom. It ensures the homeowner to interact via audio with visitors at home while the camera take the video. It also comes with an integrated battery backup to allow it to function even when the power goes out. 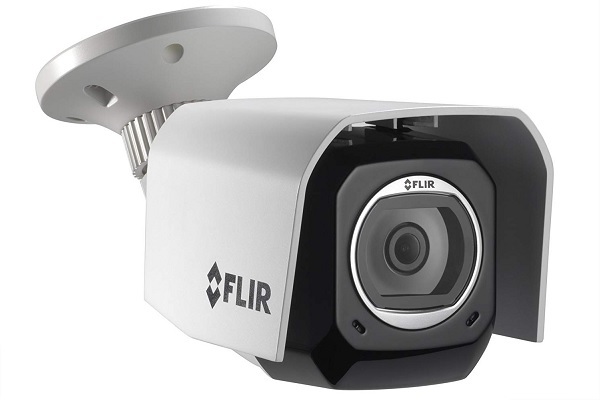 The FLIR FX Outdoor Wireless HD Security Camera is now available on Amazon for around $149.